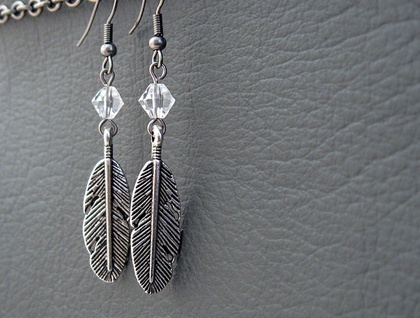 Inspired by the myth of Pegasus, the winged horse, these earrings feature highly detailed, antiqued-silver coloured feather charms. 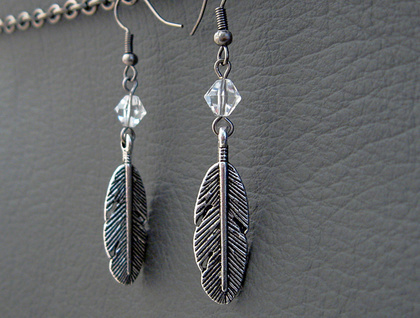 Above each feather is a clear, faceted crystal bead. These little beauties were designed to match the 'Pegasus' Feather' necklace, which is also available here in my Felt shop. The crystals are full leaded, for plenty of sparkle, and semi hand-cut, so their facets are minutely irregular, giving them a more natural look. 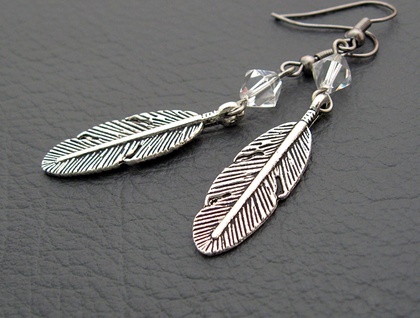 The feather charms are double-sided, and assymetrical in design, like real feathers. The ear hooks are gunmetal black in colour, contrasting with the brightness of the crystal beads. 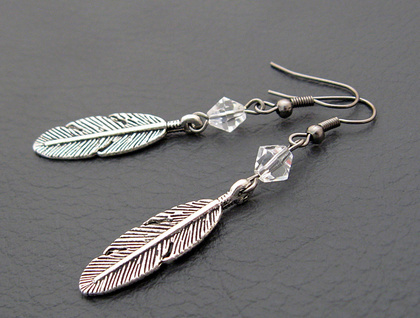 The ear hooks are copper based and nickel free, so most people with sensitive ears should be fine wearing these earrings. However, if you would prefer hypoallergenic, surgical steel ear hooks, simply request them in the ‘notes to seller' field when you check out of Felt. I’ll change them over at no charge.